Feta is a Greek cheese traditionally made with sheep's or goat's milk. Many of the commercial variations available in the U.S. are made with cow's milk, which produces a firmer cheese. The white cheese is cured and stored in a liquid known as whey brine. Feta has a soft, crumbly texture and a salty, tangy flavor. It is lower in calories than many other types of cheese and can be a healthy addition to any diet, when used in moderation. Feta cheese is lower in calories and fat than other cheeses. Plus, it's full of flavor, so a little goes a long way. Feta cheese makes a healthy addition to your diet. Feta has a strong flavor, so you can add just 1 oz. to your meals and feel satisfied. This serving contains 74 calories and 6 g of fat. The 2015 Dietary Guidelines for Americans recommends keeping your total saturated fat intake to below 10 percent of your daily caloric intake — that's 22 g per day for a 2,000 calorie diet, which you can easily track on the MyPlate app. Feta provides 4 g of saturated fat, fitting well-below these daily limits. Feta also has 4 g of protein per oz. One oz. of feta provides 14 percent of the recommended dietary allowance for calcium, based on a 2,000-calorie diet. It offers small amounts of many other vitamins and minerals, including 14 percent of the RDA for riboflavin, 8 percent for vitamin B12, 9 percent for phosphorus, 6 percent for vitamin B6, 6 percent for selenium and 5 percent for zinc. The U.S. Department of Agriculture recommends at ChooseMyPlate.gov that most adults should consume 3 cups of dairy daily. A 1½ oz. serving of feta counts as a cup of milk. Feta cheese contains 315 mg of sodium per oz. If you're a healthy adult, you should limit yourself to a daily intake of 2,300 mg of sodium. Adults who have kidney disease, high blood pressure or heart disease or who are elderly or African American may need to consume less, usually no more than 1,500 mg per day. Stick to just a single 1-oz. 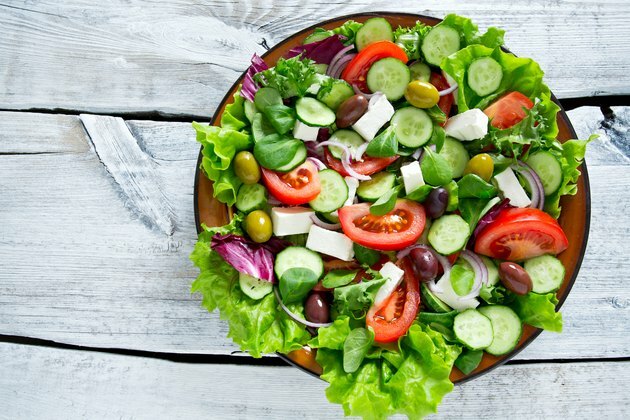 serving of feta daily to keep sodium in check as many other foods, such as breads, prepared hummus, salad dressings, sauces, canned soups and frozen dinners, also contribute significant sodium to your daily meals. Feta cheese is lower in fat and calories than many other types of cheese. Melt feta cheese over tacos instead of cheddar cheese, which contains 113 calories per oz. with 9 g of fat, 6 g of which are saturated. Include feta on a cheese plate in lieu of brie cheese, which contains 94 calories per oz. with 8 g of fat, 5 g of which are saturated. Feta cheese may be crumbled over green salads or included as part of a pasta or rice salad. Feta added to a sandwich made with roasted peppers and eggplant served in a pita makes a vegetarian meal with protein. Crumble ½ oz. of feta over a thin-cut boneless, skinless chicken breast and broil for a quick and easy — and healthy main course. Feta and mint blended into plain non-fat yogurt makes a low-calorie, high-calcium dip for cucumbers and red pepper strips. ChooseMyPlate.gov: Dairy - How Much Food From the Dairy Group Is Needed Daily?